Ht / Wt: 5'9" / 215 lb. 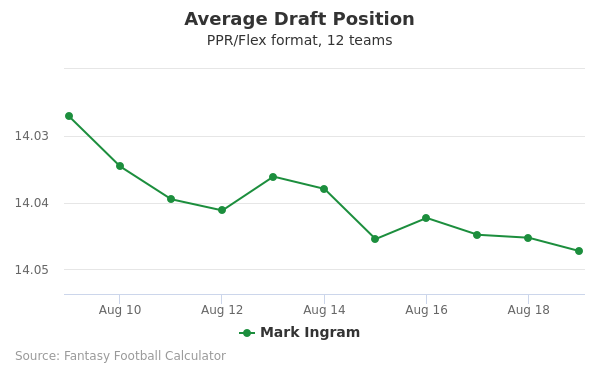 Mark Ingram's fantasy value is measured by his average draft position (ADP) in fantasy football mock drafts. 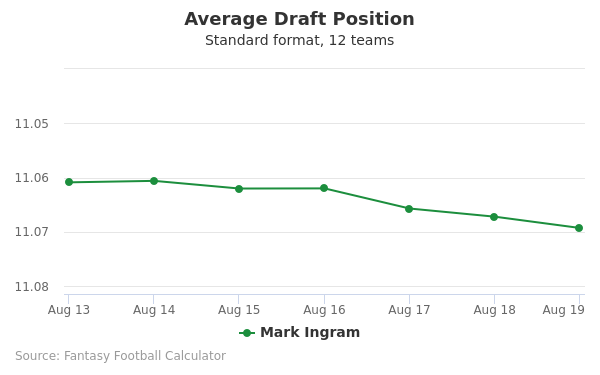 In recent drafts, Ingram's current ADP is 3.09, which indicates that his fantasy outlook is to be the 9th pick of the 3rd round, and 33rd selection overall. The code below will display a graph that updates every day to show the ADP data for Mark Ingram for the past 30 days in 12-team PPR leagues. Draft Aaron Jones or Mark Ingram? Draft Amari Cooper or Mark Ingram? Draft Mark Ingram or Phillip Lindsay? Draft Derrick Henry or Mark Ingram? Draft Mark Ingram or Stefon Diggs? Draft Aaron Rodgers or Mark Ingram? Draft Devonta Freeman or Mark Ingram? Draft Chris Carson or Mark Ingram? Draft Brandin Cooks or Mark Ingram? Draft Derrius Guice or Mark Ingram? Draft Andrew Luck or Mark Ingram? Draft Kenny Golladay or Mark Ingram? Draft Kerryon Johnson or Mark Ingram? Draft Cooper Kupp or Mark Ingram? Draft Eric Ebron or Mark Ingram? Draft Mark Ingram or Robert Woods? Draft Julian Edelman or Mark Ingram? Draft Mark Ingram or Tarik Cohen? Draft Baker Mayfield or Mark Ingram? Draft Jarvis Landry or Mark Ingram? Draft Alshon Jeffery or Mark Ingram? Draft Mark Ingram or O.J. Howard? Draft Mark Ingram or Tevin Coleman? Draft Mark Ingram or Tyler Boyd? Draft Kenyan Drake or Mark Ingram? Start Aaron Jones or Mark Ingram? Start Amari Cooper or Mark Ingram? Start Mark Ingram or Phillip Lindsay? Start Derrick Henry or Mark Ingram? Start Mark Ingram or Stefon Diggs? Start Aaron Rodgers or Mark Ingram? Start Devonta Freeman or Mark Ingram? Start Chris Carson or Mark Ingram? Start Brandin Cooks or Mark Ingram? Start Derrius Guice or Mark Ingram? Start Andrew Luck or Mark Ingram? Start Kenny Golladay or Mark Ingram? 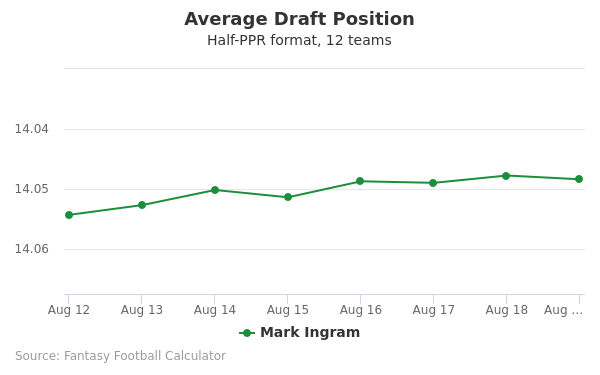 Start Kerryon Johnson or Mark Ingram? Start Cooper Kupp or Mark Ingram? Start Eric Ebron or Mark Ingram? Start Mark Ingram or Robert Woods? Start Julian Edelman or Mark Ingram? Start Mark Ingram or Tarik Cohen? Start Baker Mayfield or Mark Ingram? Start Jarvis Landry or Mark Ingram? Start Alshon Jeffery or Mark Ingram? Start Mark Ingram or O.J. Howard? Start Mark Ingram or Tevin Coleman? 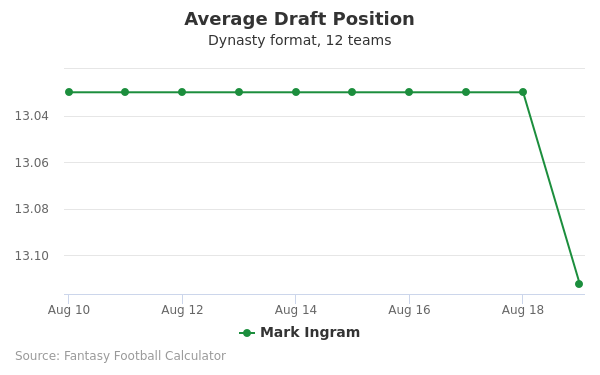 Start Mark Ingram or Tyler Boyd? Start Kenyan Drake or Mark Ingram? Mark Ingram is a running back for the New Orleans Saints. He just completed his sixth season in the NFL, and for the first time surpassed the 1,000 yards rushing mark. He was a Heisman trophy winner at Alabama, and is the son of former NFL player Mark Ingram Sr.
Ingram was born in Hackensack, New Jersey, but grew up in Michigan. He attended high school for three years in Grand Blanc, and spent his senior yea at Flint Southwestern Academy in Flint, Mich. He was a two-way starter for four years in high school, and received many honors. In his final two years he ran for 2,546 yards and 38 touchdowns. He was also an all state performer in track, competing in the 100 and 200 meter dashes and the long jump. He was listed as the No. 17 recruit nationally coming out of high school. Ingram signed with Alabama, and was on the all-freshman SEC team for the 2008 season. As a sophomore he ran for 1,658 yards and 17 touchdowns. He won the Heisman Trophy that year and helped Alabama to the national championship. While several sophomores the Heisman, Ingram is the youngest player, just less than 20 years old, to win the award as the nation's best football player. Ingram was injured for part of his junior year, but still ran for 903 yards and 13 touchdowns. He opted for the NFL draft, foregoing his senior season. On Jan. 7, 2010, Ingram led Alabama to the national championship by beating Texas 37-21. In that game he ran for 116 yards on 22 carries, scoring two touchdowns. He was named the game's offensive MVP for his efforts. In his injury hampered junior year, he ran for 157 yards against Arkansas in week four, and did not pass the 100 yard mark again. Ingram was drafted in the first round by the New Orleans Saints, who chose him with the 28th pick. His father was also the 28th pick of the draft, 24 years earlier. Ingram chose to wear the number 28 in the NFL for this reason. After two years he switched to the number 22, which he wore at Alabama. Ingram impressed scouts at the NFL combine, At the combine his 40 time was 4.34, and his 20-yard split was 2.58 seconds. His vertical leap was 31.5 inches. His broad jump was nine feet, five inches. Once drafted, Ingram signed a four year contract worth $7.41 million and a $3.89 million signing bonus. His contract included salary and a fifth-year option. As a rookie in 2011, Ingram rushed for 474 yards and five touchdowns. In 2014 he rushed for 964 yards and nine touchdowns. He also had 145 yards receiving. Ingram's best game was in October of 2014, when he ran for 172 yards on 24 carries against the Green Bay Packers. In 2015 Ingram got a lot more involved in the passing game. He rn for 769 yards, which was a bit lower than the previous year. He had 50 receptions for 405 yards, which was his most productive season to that point. He had the longest run of his career that season, which was 70 yards. He also had a 59-yard reception, which was also a career long. His number of carries went down as his number of receptions went up. Ingram has his most productive season in 2016. In week 12 he ran for 146 yards and a touchdown. He was named NFC player of the week. He had 1043 yards rushing, and he had 319 yards receiving. Ingram had 10 touchdowns. Four of those touchdowns came on receptions, and he had none before the season began. He averaged 5.1 yards per carry and that was also a career high. His yards per carry has gone up each year in the NFL. Ingram signed a contract extension in March of 2015. He has a daughter who was born in December of 2014. Ingram lists Flint, Michigan as his family home. His father spent time in prison for tax evasion and jumping bail. The elder Ingram jumped bail to watch his son play in the Sugar Bowl for the national championship.